The successor of the A-111 High End oscillator is an utterly precise analog VCO/LFO with a extremely big frequency range, immaculate tracking over at least ten octaves and nearly perfect waveforms. 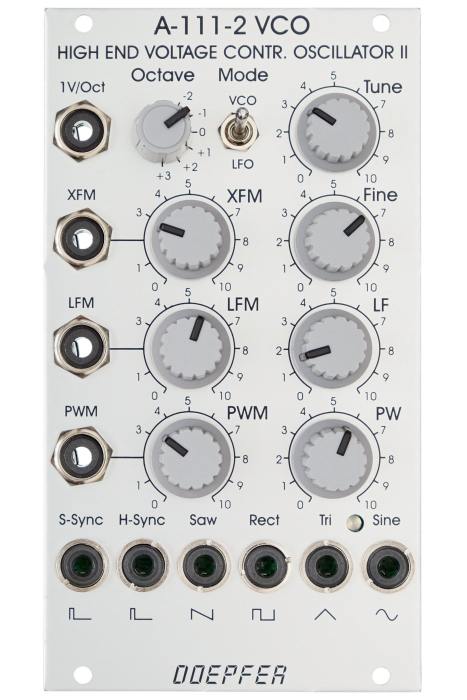 With linear and exponential FM, pulse width modulation, two simultaneous types of sync and attenuators on all CV inputs the module is really well-appointed. 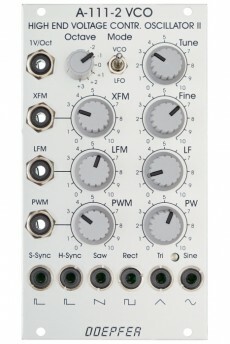 Not less than four frequency controls make tuning an ease: - switch for LFO or VCO range - octave rotary switch with six positions - fine tuning control (approximately one octave range) - coarse tune control (approximately one semitone range) The oscillator has a frequency range of at least fifteen octaves (0.0001 - 40Hz in LFO mode, 0.5Hz - 20kHz in VCO mode) and has perfect Volt per octave tracking over at least ten osctaves, typically in the range of 20Hz to 20kHz. Frequencies below 25Hz are visualized with a two-color LED. 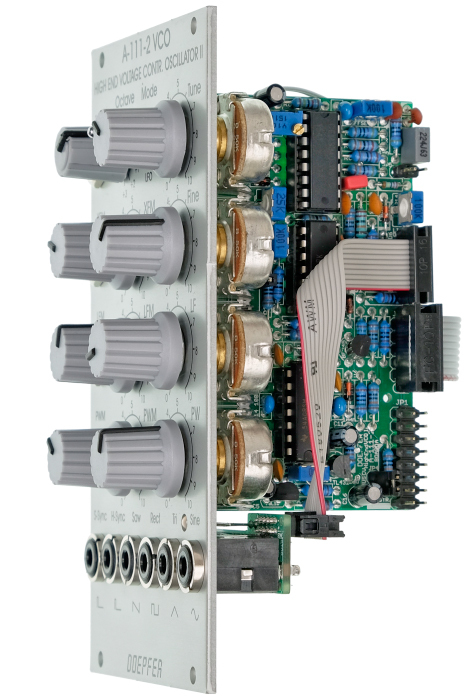 An 1V/octave input without attenuator is expanded by two scaleable FM inputs, one for linear and one for exponential frequency modulation. 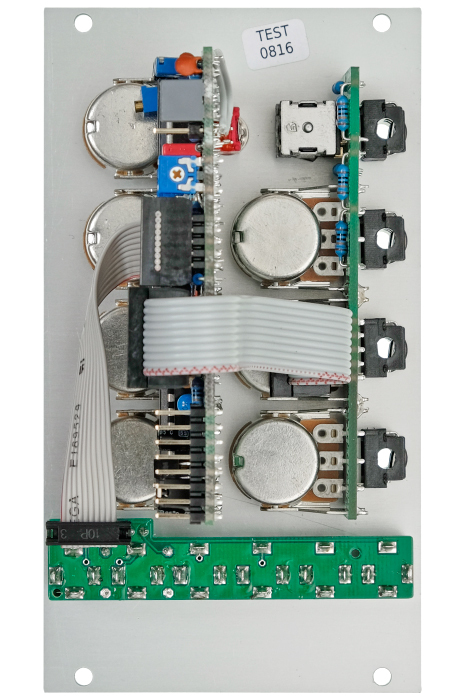 Using a jumper you can decide whether the module obtains pitch CV via the internal bus. The VCO has a triangle core from which sawtooth, pulse and sine are derived. The wave forms are almost perfect and sans glitches. The pulse width can be set with a control from 0 to 100% and of couse it can be modulated. The A-111-2 features not only one but two inputs for oscillator synchronisation - one for hard and one for soft sync, which both differ in sound with the hard sync being more aggressive and richer in harmonics.